REV'IT! is dropping some bombs this Fall with a few loudly-requested multi-season commuting/touring products alongside some day-saving rain gear. They've also completely revamped their base layer lineup, utilizing brand new mapping technologies that will intelligently respond to your body's wicking needs both in cold weather and warm weather riding with temperature-specific pieces. Additionally, there are two new gloves designed exclusively for all the serious female riders who want to push it through all seasons and weather conditions. Here, we'll provide a quick glimpse at each of the products, but stay tuned for our individual blogs that will feature video reviews of all the new gear. The heavy hitter of this year's lineup is the REV'IT! 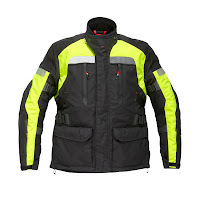 Legacy GTX Hi-Viz Jacket in addition to the women's specific REV'IT! Legacy GTX Ladies Jacket and REV'IT! Legacy GTX Ladies Pants. Since this jacket and pant combo, released for the men in last year's Fall collection from REV'IT!, is focused on touring and commuting, it is only logical that there would be a hi-viz version of it. Also, the ladies have been clamoring for their own version of this multi-season all-weather Gore-Tex monster and REV'IT! has delivered on both fronts. Touting all of the same features as last year's version, the hi-viz and women-specific versions are sure to continue the legacy of the Legacy's immense popularity. REV'IT! has also revamped all of their rain gear for Fall 2011, moving away from PVC and ensuring that all of their gear is now REACH certified. REACH is a European safety standard that bans the use of over 30,000 harmful chemicals that damage the environment and threaten the safety of the workers. The REV'IT! 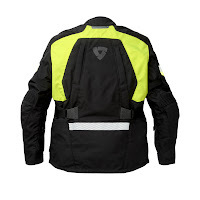 Pacific H2O Rain Suit offers riders a full one-piece suit that is available in a hi-viz colorway. The REV'IT! 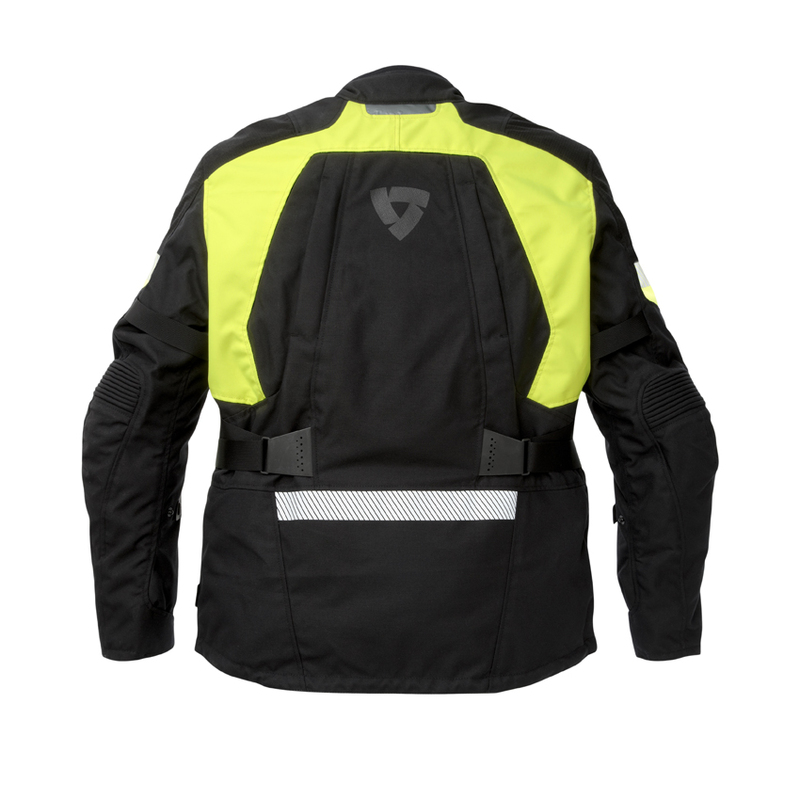 Nitric H2O Rain Jacket is the big brother to the less-technical REV'IT! 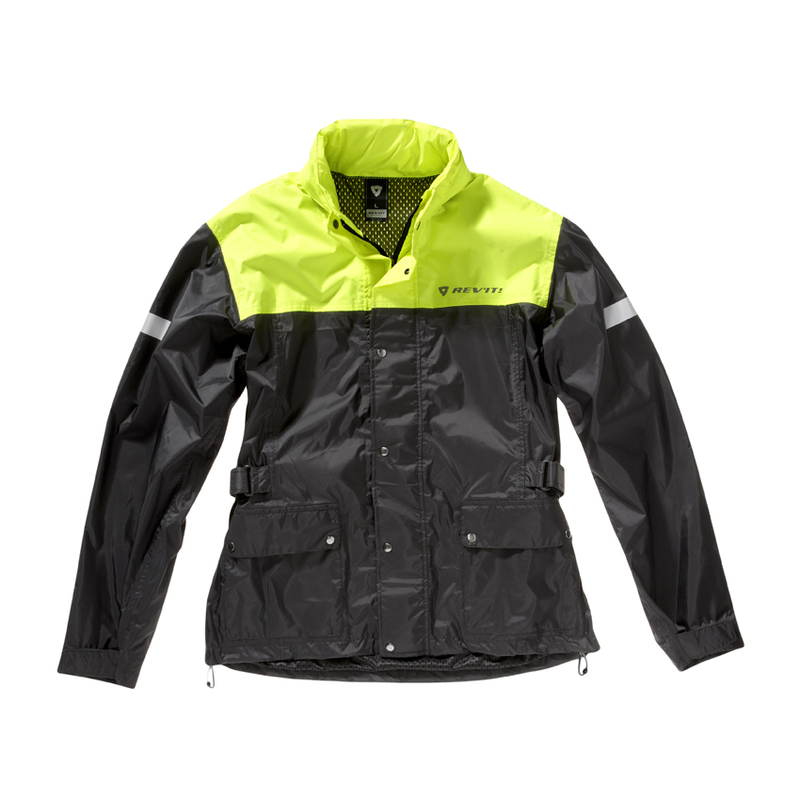 Cyclone H2O Rain Jacket and both pair up nicely with the REV'IT! Acid H2O Rain Pants. 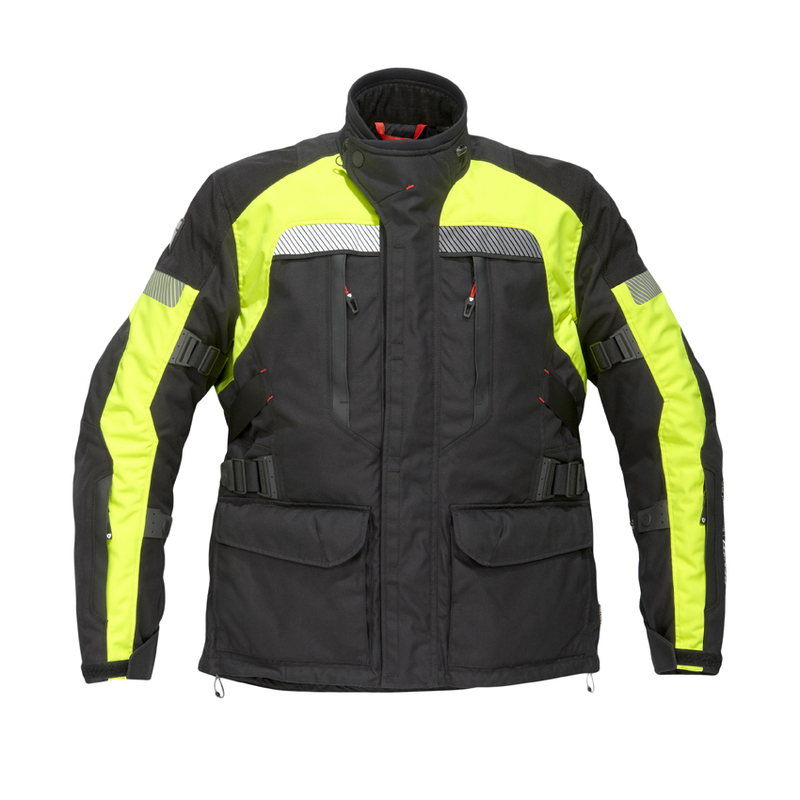 Each of these jackets is available in a hi-viz colorway for max visibility. Also, all the new rain gear is extraordinarily lightweight, rolling and stuffing into their included sacks in a matter of seconds. Also completely redesigned with the REV'IT! lineup is their base layer collection. With a summer-specific and winter-specific setup each for the men and ladies, these base layers are using a 3D round knit technology that eliminates uncomfortable seams and allows for strategic mapping with different weaves in different zones. For instance, at the shoulders and elbows where armor will sit, there are spaced-fabric areas that allow breathability in areas that will sweat more. The armpits, chest and back all feature strategically-located weaves that will help wick moisture away and keep you cool (or warm) and dry. For the winter, the men's REV'IT! Glacier LS Shirt and Pants; REV'IT! Trinity LS Shirt and Pants for women. For summer, check out the REV'IT! Oxygen Shirt and Pants and the REV'IT! Violet Shirt and Pants. 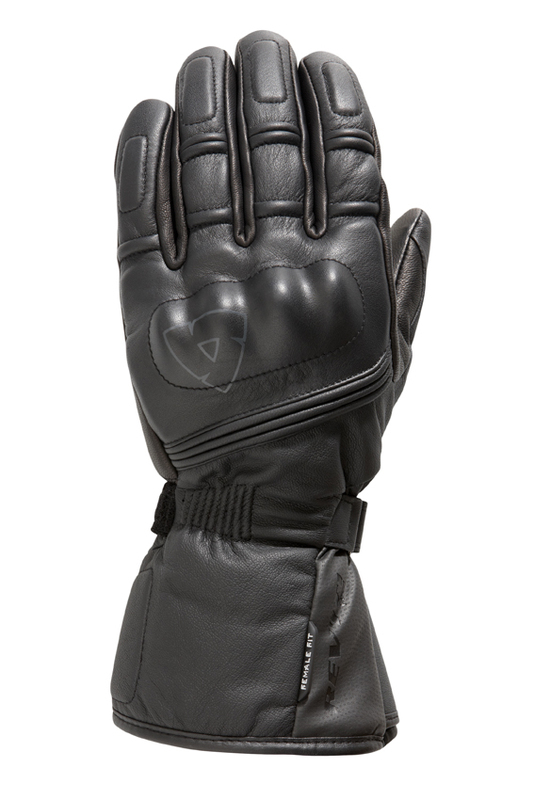 There are also two new gloves for the ladies for Fall 2011, which are female-specific versions of popular REV'IT! men's gloves. The brand new REV'IT! Orion GTX Ladies' Gloves are a Gore-Tex winter-specific version of the men's gloves that bear the same name from last season. Gore-Tex waterproof breathability with highly technical materials in the shell and a Thermolite liner provide warmth and protection from the elements. The REV'IT! Zoom H2O Ladies' Gloves are built for the female touring rider looking to stay warm and waterproof and not pay an arm and a leg to do so. With a leather exterior and a hard shell knuckle, you're ensured both impact and abrasion protection, and the Fiberfil interior keeps you good and warm. Again, stay tuned for upcoming posts with detailed video breakdowns of each of these new products.